UPDATED Jan 19th, 2009 - the updated doc (v1.01) reflects SRM update 1, general minor corrections, and the removal of the ONLY step (Solutions Enabler) that required an EMC powerlink login. Folks, here it is - the "all-in" step-by-step guide for setting up Site Recovery Manager with nothing more than two ESX servers (which you can even do with home-brew servers, as noted here) and the Celerra VSA. If this is your first read, you can either just click on the document below or start the 101, 201, 301, 401 journey here. This guide isn't the first one of these out there. I think my respected friend Adam Carter at Lefthand did it first (Adam, hope you're enjoying HP!). The NetApp one is pretty good too. What I like about ours is the extreme completeness. It's also nice that the Celerra VSA has no timeouts, no limits (except that you'e not allowed to use it in production). A quick shout out... This was absolutely yeoman's work by one of the newest members of the Global EMC VMware Specialist squad - Bernie Baker, with strong assists from one of the other newbies - Stephen Spellicy. Both of these guys started relatively recently, and this work is (IMHO) FANTASTIC - it highlights that this stuff can be EASY (and that they have what it takes to have a early impact). Bernie - you've set the bar high for the team and yourself - GREAT WORK! Folks - if you don't listen to these, I would highly recommend it.... They cover broad topics, and tend to be not the usual marketeering schlock, but rather a frank dialog between technical folks who work with VMware every day. Topic that are on my mind below. If these are interesting, dial in. Storage Best Practices for VMware - what we're seeing work well. And most importantly... anything you want to ask me!!! A really good post on single initiator zoning on Yellow-Bricks... This has been in all the EMC VMware Academy training sessions we've been doing for more than a year. While we run our "best of the best" through VCP, everyone who is a pre-sales technical resource needs to do the VTSP and these "Academies" which compress the "Install and Configure" course into 2 days (with EMC-specific content on storage, backup and DR you don't get in the VCP training). Glad to see VMware saying the same thing. Soft vs hard zoning is subjective (i.e. up to your preferences, and debatable), but single initiator zoning is not. Do yourself a favor and don't create a single zone for all your ESX servers and VCB proxies. I've also been up to my eyeballs over the last few weeks (last week alone I worked with customers who in aggregate have more than 20K VMs deployed - wow), but have some free time today, so am hoping to push out a couple of blog updates (including some long awaited Celerra Sim 201 stuff) I've been working on for a while. Customers running VMware on NFS (on NetApp or Celerra) - make sure you read Scott's post on NFS.lock.disable (hint, leave it at the default of 0) here. Note that this isn't a NetApp technical issue per se, except for in the sense that they published their best practices with this incorrectly in the past). The same thing would occur on any NFS server (including the Celerra). Moral of the story to me? Locking isn't inherently a bad thing (it's often incorrectly bandied about as a core "VMFS issue" when people are FUD'ing VMFS scaling incorrectly). Locking (at the SCSI on block devices and file level for VMFS and NFS) is an intrinsic and important property of ESX - and critical for ensuring no split-brain condition occurs. It's very important for all of us to prioritize best practices around production use cases, not anciliary use cases. This may make me a bit of a fuddy-duddy, but I think it's the "right thing to do". While the VMware issue that caused ESX snapshots to be slow on NFS datastores was VMware's - not NetApp's (fix in ESX350-200808401-BG), I personally think it's a mistake to recommend a workaround that compromises availability (since on NFS **and** on VMFS - where the file locks are maintained in the VMFS metadata area - the file locks are an important governator on VM's being booted on multiple ESX servers). Again, people in glass houses shouldn't cast stones (i.e. we've made that mistake too in the past!) - but one of those things to consider as your vendors all bend over backwards to compete. Did you see EMC and Cisco buy more VMware shares? For big companies - the amounts are small - but the message is clear - Cisco and EMC are doubling down here. I'm pretty pumped with the Obama win last night. Some of my best friends and colleagues, smart and whom I respect are Republicans. It is perfectly possible to disagree without being disagreeable. But that said, I do feel like it's a fresh start, and is a great testament to the United States' ability to remake itself and adapt. Someone asked me out of band (thanks for asking, MattL) what I would do to quickly get a envelope of an iSCSI target. In all the post-VMworld followup, I don't want to do a long dissertation here, but quick off-the-cuff comments may be useful. FYI, these are the quick set of tests we do during the application validation testing to quickly see if we're on the mark before we start with app workloads. Read on for the details! We may face each other often on the battlefield, but I relish every battle :-) My good friend an colleague Vaughn Stewart has joint the blogosphere - check it out, and add it to your reader!. Vaughan - welcome, and drinks are on me at VMworld! Vaughan, I love ya, man - but come on (seriously) on TR-3697 - it's like something Chuck would make :-) I love NFS storage for VMware - it doesn't get the love it should, I love iSCSI storage for VMware, I love FC storage for VMware, I love FCoE storage for VMware (and on this one, although I literally have at least a few grand riding on iSCSI, I've come around to the "it's not a conspiracy" view like Dave has here - though "wait" is subjective - VMworld is right around the corner). So long as it's storing VMs and the customer is happy, I'm happy. 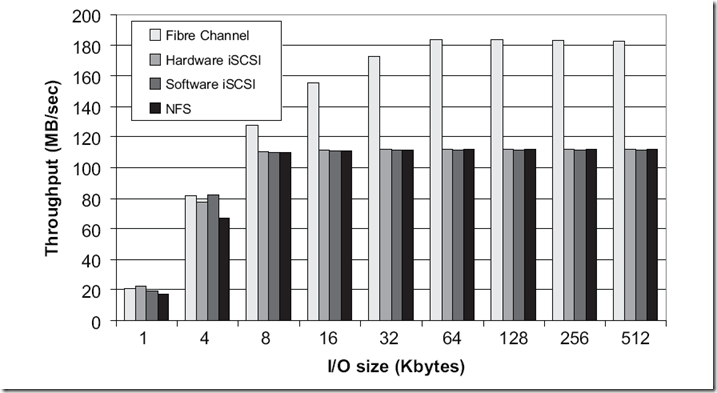 "The goal of this testing was to compare the throughput capabilities of ESX 3.5 with NetApp storage using FC, iSCSI, and NFS protocols in a real world environment." You guys have "throughput/IOPs" shown only in relative, not in absolute. 84 144GB drives with 16 VMs driving the IOMeter workloads with * 10GB of data each on them = 1.3% utilization (rounding up!). This is a workload and a comparison chart that Netapp dreams of - but unfortunately doesn't match the noble testing goal. I love NetApp filers. I own them. I have bought them with my own $$. What they do they do extremely well - but WHY do you guys insist on running workloads in these benchmark docs with these crazy low utilizations?? WAFL = greatest strength in some use cases; greatest weakness in others. That's not BAD, that's engineering. Engineering is all about tradeoffs. WAFL's tradeoff is free snapshots in exchange for non-linear performance under normal workloads and normal utilization. It's your superpower, and your kyptonite. Kickass write perfomance when there are loads of free spaces to write to. Another manifestation is post-process deduplication - but not not pre-process (which no one has figured out for production storage but is our goal) which is really another GREAT manifestation of WAFLs underlying characteristics) Good read performance overall. Poopy write performance when it's random with a full and fragmented filesystem. BTW - do NetApp filers catch fire under this condition - NO, but they do slow down. In the same way our arrays don't catch fire with snapshots (as much as you guys say they do). But both are designed for different tradeoffs. Again - that's not bad, that ENGINEERING - it's all about trade-offs. EMC has many of the same sort of things, in different places. You guys make great platforms, so do we. Come on, let's not be Chuck here. If you wanted to be real-world - let's do a broad set of IO sizes... you're a smart dude (you REALLY are) - so let's see it at 64K (the current max, larger than that and ESX starts chopping them up. Let's see that a 10%, 20%, 50%, and 80% utilized. Let's see it after a few days of random workload. NFS and iSCSI are fantastic and near FC in throughput and IOPs on small (4/8K) IO workloads (though consistently higher in CPU utilization - though MHz are close to free these days), but they diverge (this is not bad, it's expected) at large IO sizes, and large througput workloads - even with 2GBps FC (which is the chart above from VMware) - which no one even buys anymore. This is different with 10GbE and jumbo frames of course. When you publish a benchmark that shows "we filled this to 70%, ran it with a random write workload for 3 days, and THEN ran the benchmark, and we compared it with current FC technology", you can come over for dinner :-) Ok, screw that, I'll buy dinner AND drinks at VMworld! "For what it’s worth – personally, certainly I don’t necessarily represent EMC in this context – I appreciate having as formidable a competitor as Network Appliance. With other competitors, we compete with them, and it’s a slow waltz, but with you folks, it’s a tango. It makes us better, win or lose with any individual customer, and in the end, it’s good for the industry and the customers." "I completely agree. I feel the same way about EMC." Glad to see that people are having downloading and success with the Celerra VM on VMware Workstation based on this original post. I wanted to provide a quick "HOWTO" to help, and will publish a 201 (setting up Replication and a 301 - configuring SRM). Most folks are doing well if they just RTFM, but I thought a little "hand-crafted walkthrough" might help others. The standard documentation is geared towards VMware Workstation, which is the officially supported target (BTW, you don't need to ask, we're making ESX OVF a standard package :-), so some people stumbled a bit when trying to use it with ESX. 301 series (configuring Site Recovery Manager, VDI mass replicas, etc). UPDATED (old VSA is retired!!) Get Yer Celerra Virtual Machine here! UPDATED (2:30pm 4/1/2009) – there is a new Celerra VSA here. I’m keeping this old post for the threads. By now, it should be obvious to everyone (but surprisingly it's not) that VMware is driving 4 large scale IT trends from an Infrastructure standpoint. Consolidated IO workloads - even before point 1 - even when you move from 1:1 to 20:1 consolidation of I/O becomes a core design bottleneck. It's always shocking to me that people don't realize this. Let's say you're an Dell shop, and standardize on PowerEdge 2970s. How many NICs do you have in a standard physical server? It's usually 2-4 (let's say it's 3 for the sake of being even handed). When you consolidate that only a honkin' R800 with tons of RAM with ESXi, how many NICs do you have? perhaps 12 (4 LOM, 2 x quad-ported PCIe NICs on the riser card). Two go for service console redundancy (you ARE using a redundant service console, right?!?! ), then you lose two (maybe one) for VMotion - so you have 8 left. If you use either vmkernel IP-based storage (iSCSI or NFS), you will use some for IP storage, some for pNICs sitting off vswitches supporting Virtual Machine vNICs. So quick math - 60 old physical NICs are now consolidated on 10 NICs (with the potential of less if you're using some for IP storage). Shared storage becomes critical - This is true in a good way and a bad way. It's true in a good way that you're bringing stuff that was on lower-availability infrastructure onto things that are more solid and consolidated, and that you're gaining the massive business flexibility benefits you get from VMotion/DRS, Storage VMotion , VM HA, Site Recovery Manager etc. It's true in a bad way in the sense that it's making it a cost prerequisite for many things that use to be a "C:\ on physicaldisk0" is now happily living as a VMDK on a VMFS or NFS datastore. This is forcing all the storage vendors (EMC included!) to think about our infrastructure in a new way. Management tools need adapt - It just takes one thing to make this sink in. Let's say you setup an SRM recovery plan. Life is good. Then you svmotion one of the VMs out of the container being replicated - how valid is that Recovery Plan now? Management tools need to integrate with Virtual Center, and have as a core premise that the app container is a virtual entity. This has impacts that aren't immediately obvious - but perhaps more important than all the other stuff put together (topic for another post).